Every successful Catholic parish church is dependent on the time and talents of its parishioner volunteers. The OLV Parish recognizes the valuable contributions of its volunteers in parish ministries and communal activities through a Volunteer of the Month and Volunteer of the Year nomination and award presentation process. OLV Volunteer of the Month Nominations are desired for exceptional parish volunteers who have gone above and beyond their ministry call to positively impact our parish’s communal activity and faith life. A nomination form can be found below and are also located in the Gathering Space near the Worship Space entry doors. THANK YOU to all our volunteers' great works!!!! Opportunities for lifelong Catholic religious education focused on adult learning; through the study and reflection for life-long application of sacred scripture, church history and the sacraments; and catechesis of theological, doctrinal and spiritual topics related to the Church. Please contact the Parish Office or Pastor for more information or a schedule of events. Trained, designated and appointed boys and girls, who have already received the Sacraments of Reconciliation and Eucharist, and who desire to serve God in the conduct of Church liturgies by assisting (ministering to) the clergy in the sanctuary. A required sacramental preparation class for the baptism of a child (under the age of 7). Please contact the Parish Office to register. Serves as a member of a consultative body to the pastor regarding present and future parish building and ground operations. Responsible for tracking, planning, scheduling, organizing and facilitating building repairs, snow removal, landscaping, grass cutting, flowers, cleaning, etc. The faith formation (also known as Religious Education (RE)) of children and their families. The faith formation to youth and their families includes RE studies, retreats, service projects, etc. The preparation process for baptized, practicing Catholic children and/or youth for their reception of the Sacraments of Reconciliation (also known as Penance and Confession) and first Eucharist and/or the Sacrament of Confirmation (grade 8 and higher) to complete their Sacraments of Initiation within the Roman Rite of the Catholic Church. Trained, designated and appointed ministers who assist the clergy with the distribution of Holy Communion. These ministers must be: at least 16 years of age; specially trained per diocesan policies; Catholics in good standing; and mandated in writing by the bishop of the Diocese of Colorado Springs (normally valid for a period of 3 years for and only within their parish of mandation). Trained, designated and appointed ministers who assist the clergy with the distribution of Holy Communion to those unable to attend church liturgies within the jurisdictional boundaries of the parish. These ministers must be: at least 16 years of age; specially trained; Catholics in good standing; and mandated in writing by the bishop of the Diocese of Colorado Springs (normally valid for a period of 3 years for and only within their parish of mandation). This ministry plans and decorates the parish church's gathering space during the various liturgical seasons. The parish's Finance Council examines the needs, resources, and budget of the parish and, as an established consultative body, advises and consents (when needed) with the pastor or parish administrator and Parish Council on appropriate distribution of funds and on allocation adjustments, when and where required. Prepares baptized, practicing Catholics for reception of the Sacrament of Eucharist and/or Confirmation to complete their Sacraments of Initiation within the Roman Rite of the Catholic Church. Please contact the Pastor for more information and to register. Contacts grieving spouses and families to assist them with post-death spiritual counseling; the necessary planning and coordination of parish church activities associated with funeral related liturgies (including a Mass of Christian Burial; burial (interment (casket) or inurnment (cremated remains)) following the liturgy; post-liturgy community receptions, etc.). Please contact the Pastor or Parish Office for more information. Promotes parish fellowship, while demonstrating the gathered community’s grief and support by organizing and facilitating a reception after a funeral liturgy/burial for parishioners. Trained, designated and appointed ministers who assist the clergy during church liturgies by greeting people as they arrive; assisting the handicapped with seating; facilitating the collection of the offertory from the faithful assembled; bringing forward the gifts of bread and wine during the presentation portion of the Mass; etc. These ministers must be appropriately trained and dressed, and should be at least 15 years of age. - Scheduled to meet on Tuesdays, from 9:00 to 11:00 a.m., immediately following the morning 8:30 a.m. daily Mass in a downstairs religious education (RE) classroom. This year-long program involves up to 3 separate, study sessions (beginning after Labor Day and concluding before Memorial Day). The study session includes a weekly video presentation, a companion workbook with questions and discussion periods. Each session is led and guided by a designated facilitator: who works to guide discussions on that week's subject matter and promotes a comfortable, compassionate and sharing environment to enhance adult catechetical discussions about our Christian Catholic faith. Helps to promote lively, parish fellowship by serving coffee, juice, and donuts/pastries the First Sunday of every month (excluding July and August). Also helps to facilitate special events also (such as: the parish picnic; periodic potlucks; after-Mass First Communion and Confirmation light receptions; etc.). A men's Catholic, fraternal organization (with councils at most parish churches) which meets the first Tuesday of each month at 7 p.m. and assists, via charitable efforts, the parish and local community. This ministry is presently being formed. Please check back later for further information. A required process of preparation for the reception of the Sacrament of Matrimony within the Roman Catholic Church. 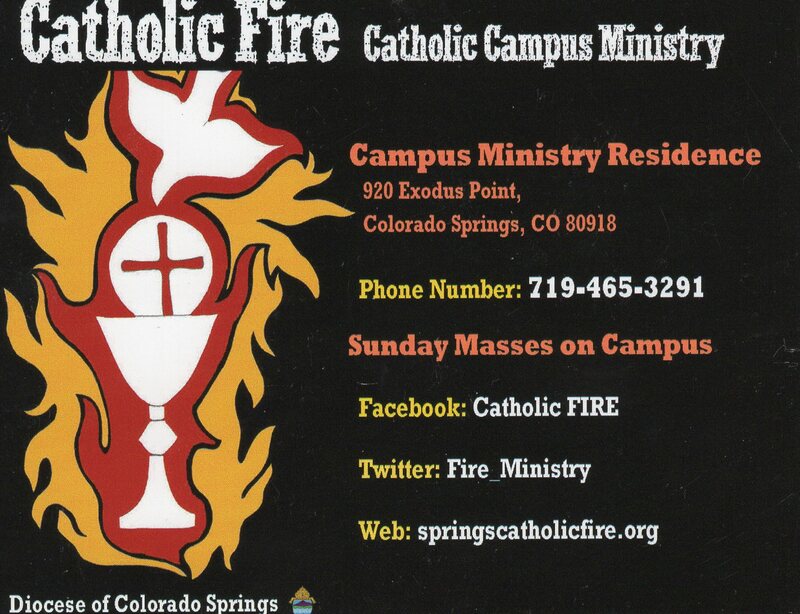 Of note: the Diocese of Colorado Springs generally requires a one-year preparation process; although it may be completed in a shorter time period based on the wholehearted investment by the to-be-wed couple of their time, efforts and some finances (to cover some program-associated fees for workbooks, etc.). Please contact the Pastor for more information and to set an appointment. Please also consider reading the information available on this website's tab, entitled: "Wedding Information" for more information on the preparation program and planning for reception of the Sacrament of Matrimony. A competent, trained, designated and appointed minister, who assists the parish clergy by coordinating the necessary, standardized musical selections for parish liturgies (such as: Sabbath celebrations of the Mass, Masses on Holy Days of Obligation, Masses of Christian Burial, Wedding ceremonies, etc.) with instrumentalists, cantors, choir members and the assembly. Assists in leading the gathered assembly of the Catholic faithful in song during the prescribed liturgies; giving joyful praise and thanksgiving to God. As a parish consultative body, the Parish Council assists the pastor in fostering the pastoral activities of the parish by promoting the life of the Gospel among the people of God and advises and/or consents (when needed, in consultation with the parish's Finance Council) the parish or parish administrator on appropriate distribution of funds and on allocation adjustments, when or where required. Serves as a member of a parish-level prayer group to daily pray for general (i.e., world peace, for the Church and our nation, etc.) and specific requested prayer intentions. This group gathers together weekly to help with parishioner and local needs by making and providing knitted/crocheted blankets; prayer shawls; and other related items. A process for those seeking an understanding of the Catholic faith, tradition and practices in order to discern becoming a Catholic Christian within the Roman Rite. Includes the Sacrament of baptism, first reception of the Sacrament of Eucharist and conferral of the Sacrament of Confirmation of a child (over the age of 7) or an adult. Please contact the Pastor for more information or to register. Provide faith formation (religious education) and scriptural study information for adults in the process of faith conversion and formal entrance into the Roman Catholic Church. Trained, designated and appointed ministers who assist the clergy in church liturgies by proclaiming pre-selected/assigned Old Testament or New Testament scriptural passages. These ministers must be Catholics in good standing, well-articulate and be at least 15 years of age. Educates and informs parishioners regarding the promotion of the dignity of all human life (from conception until natural death) via the teachings of the Catholic Church. Also, includes the annual Christmas giving tree to help the needy within the local parish area. On a Sunday afternoon (once a month), parishioners gather at a scheduled/pre-designated group parishioner’s home in social fellowship and to pray the Holy Rosary, seeking the intercessions of Our Blessed Mother Mary for prayer petitions (for individuals, families, Church, our nation, world peace, etc.). Trained, designated and appointed ministers who assist the clergy in church liturgies by assisting, preparing and pre-positioning liturgical instruments (i.e., lectionary; communion chalices; purificators; etc.) in the sanctuary area in preparation for a parish liturgy. These ministers must be specially trained, Catholics in good standing, and be at least 15 years of age. Educates and informs parishioners regarding the promotion of Social Justice via the teachings of the Catholic Church. Encourages and enables others to respond to God’s call to the myriad of related topics under the “Social Justice” umbrella – such as: the Dignity of the Human Person; the Preferential Option for the Poor and Vulnerable; the Dignity of Work and the Rights of Workers; Care of God’s Creation; etc.). Parishioners who are drivers to church, meetings, and medical appointments. They visit homebound and help with the light household tasks in time of health challenges and/or emergencies. Works to further the mission of our parish community by fostering an awareness of God's abundant blessings in the gifts He has freely given each of us. Encourages and enables others to respond to God's love by sharing their gifts of time, talents, and treasures freely also to serve Jesus Christ and to give witness in His Church through effective stewardship habits and practice. Within the parish community, educates and informs parishioners regarding the call to Christian vocations (i.e., priest, deacon, married and single life) as Church to bring about the Kingdom of Heaven – God’s will on Earth. Coordinates and collaborates with couples requesting to receive the Sacrament of Matrimony within the parish Church. This includes: the selection of wedding-peculiar scriptural readings and musical selections; organizing and scheduling a practice (usually the afternoon or night before the wedding), informing involved parties of what is permitted and not permitted to be added in the Rite of Holy Matrimony and/or the Order of the Mass, etc. Provides a warm welcome to all families and adults who are new to our parish faith community. Members of this committee make a personal phone call to each newly registered individual/family and distributes Welcome Packets, as appropriate or needed.